Founded in 1992, Londonderry was the first cooperative independent living 62+ community on the Eastern Shore of Maryland. Growing in size from an original 15 individual cottages and 17 residents, the Londonderry community is now home to over 100 cottages, 26 apartments and 150 residents. 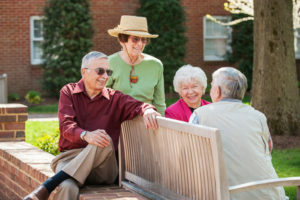 Cooperative senior housing is a unique option for retirees seeking a retirement lifestyle while maintaining control over their investment. Located on the original tract of land granted in 1667 to citizens from Ireland seeking independence and the freedom of choice, Londonderry remains dedicated to those ideals today. In this resident-driven culture, co-op owners have a say in how the community is managed and operated. The retirement dream sometimes includes owning a house on the water. Londonderry on the Tred Avon can make that dream a reality. Located on the Tred Avon River, a tributary of the Chesapeake Bay, our community has 1500 feet of shoreline. Kayaking, sailing, and power boating are just outside your door with over 600 miles of tidal shoreline to explore in Talbot County. There are a number of public landings which makes water access convenient for your boating and recreational needs. The area is home to a working oyster fleet of skipjacks and is renowned for racing log canoes. As you walk Londonderry’s grounds, you may observe a kayaker quietly paddling, witness the arrival of the osprey in the spring of each year, or hear the sound of a fish jumping. The sounds and sights of waterfront living, known to many in this region as the “Land of Pleasant Living,” are sure to enthrall and inspire you. Surrounded by nature, residents enjoy strolling along the community’s paths, observing a variety of wildlife, watching the sun set on the river, or dining on the porch with friends. The friendly, vibrant community provides for an active independent lifestyle and personal choice. Wellness of mind and body are important to us. Our residents are engaged and enriched, whether taking a class at Londonderry’s Community Center or visiting a nearby museum. Londonderry is also adjacent to a vibrant community offering cultural activities, fine dining, volunteer opportunities, shopping, and exceptional health care. Resident owners enjoy the amenities that make Eastern Shore living easy, including full-service dining, stress-free maintenance, and convenient transportation. Londonderry on the Tred Avon’s traditional cooperative real estate model offers financial and tax benefits while simplifying retirement living. We take care of your needs so that you can get busy living! Londonderry on the Tred Avon is a vibrant, independent living cooperative that promotes wellness of mind and body.